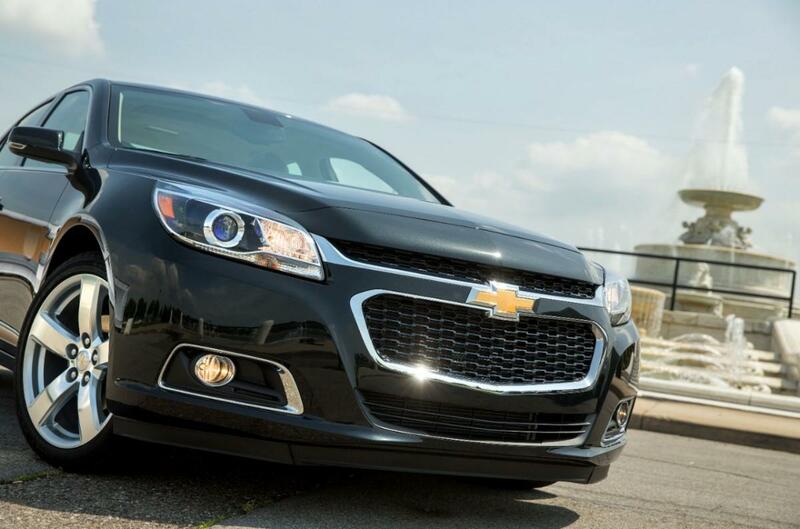 A new process used to update the Chevrolet Malibu for the 2014 model sounds more like the plot of a sci-fi movie than anything tied to designing cars. 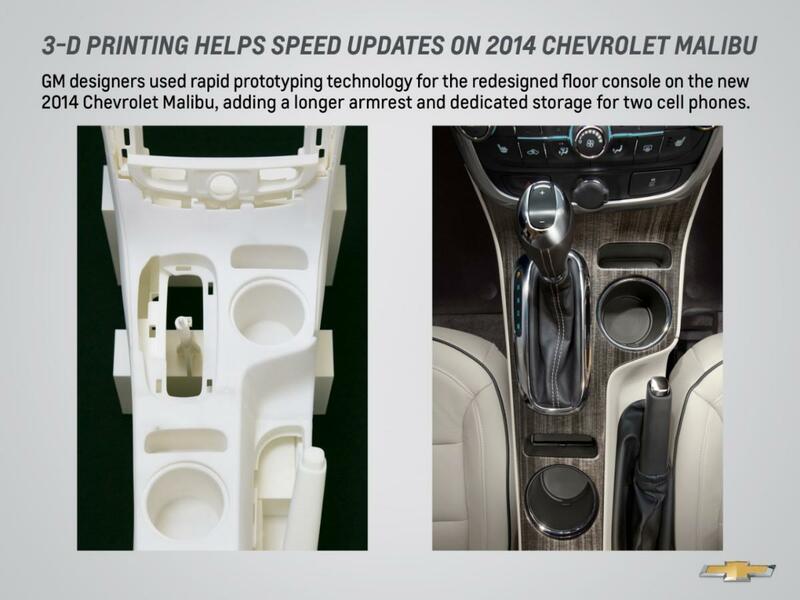 To refresh the Malibu’s interior and exterior, Chevrolet designers used a process known as rapid prototyping, which involves 3-D printing of parts. The technology, as described in a Chevrolet press release, “literally” grows prototype parts out of powder or liquid resin at a fraction of the cost associated with building tools to make test parts. Rapid prototyping, which uses processes officially known as selective laser sintering and stereo lithography, requires specialized software, math data and digital lasers, which accomplish in days what would have taken weeks of clay sculpting in the past, notes Chevrolet. In a nutshell, it enables designers and engineers to more quickly build test versions of car components and systems that they can actually see, touch and feel in precise one-third scale and full-size models without having to make changes to production tooling, saving hundreds of thousands of dollars. On the Malibu, rapid prototyping was used to update the sedan’s new floor console (below), which now features a pair of integrated smartphone holders for the driver and passenger. The new console also weighs less, which helps contribute to the Malibu’s improved fuel economy over the previous model. Rapid prototyping was also used to update the Malibu’s center stack trim and redesigned front fascia, enabling aerodynamic and climatic wind tunnel testing without expensive production parts. In addition, the process was used to re-sculpt the Malibu’s front seat back panels to improve the knee room for rear passengers. First, selective laser sintering fuses plastic, metal, ceramic or glass powders in cross sections, as indicated in the Chevy press release. Then, a laser scans a pattern on the surface of the powder, fusing the particles together into a layer four-thousandths of an inch thick. As each new layer of powder is added, scanned and fused to the previous one, the part gradually takes shape within the 28-cubic inch reservoir. Stereo lithography then combines photochemistry and laser technology to build parts from liquid photopolymer resins. The parts are also built up in layers as a UV laser traces the section onto the surface of the resin, curing the liquid into a solid as it scans. Because the resin won’t support the parts being formed, a fine lattice-like structure is generated below each part during the manufacturing process. However, what’s most intriguing about rapid prototyping is the capabilities that it appears to give a carmaker when moving from a concept to a full production vehicle. With the availability of this kind of technology, it seems that carmakers wouldn’t be as limited by some of the previous factors that have prevented them from turning some of those hot concepts into actual road vehicles. In fact, rapid prototyping may even enable carmakers to make better use of consumer input during the entire development phase of a vehicle before the car goes to market. The process of 3D modeling is already being used by Pininfarina to potentially develop a new car called the Sergio based on a concept, as reported by Digital Trends in an earlier article. Either way, I’m certain we’ll be hearing a lot more about rapid prototyping from Chevrolet and a lot of other automakers. Still, what’s most exciting is what the technology could potentially give birth to in the future.